At Red Couch Recipes, you know I love red and I also love lime green at Christmastime. Come on and sit a bit at my table. The table is set and we are ready to eat a fine Christmas feast. 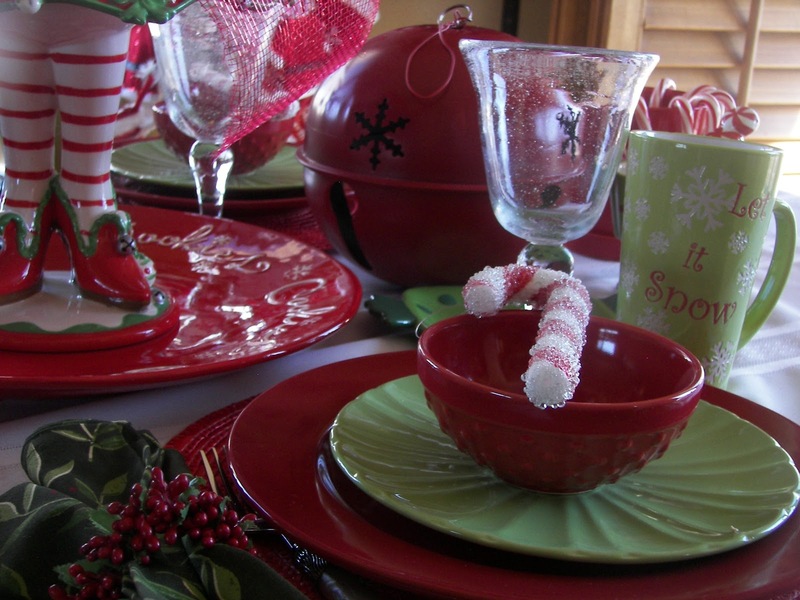 The red bowls, red dinnerplates, and green salad plates are just some of my everyday dishes. The footed cake platter was a gift from my sister Jacqueline, Purple Chocolat Home, a Christmas or two ago. 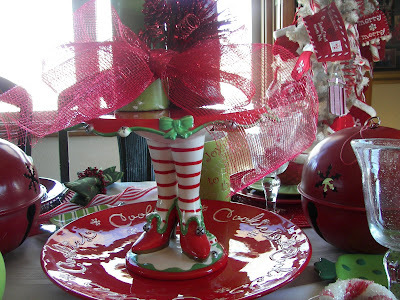 I just love those footed cake platters -- so cute and whimsical. 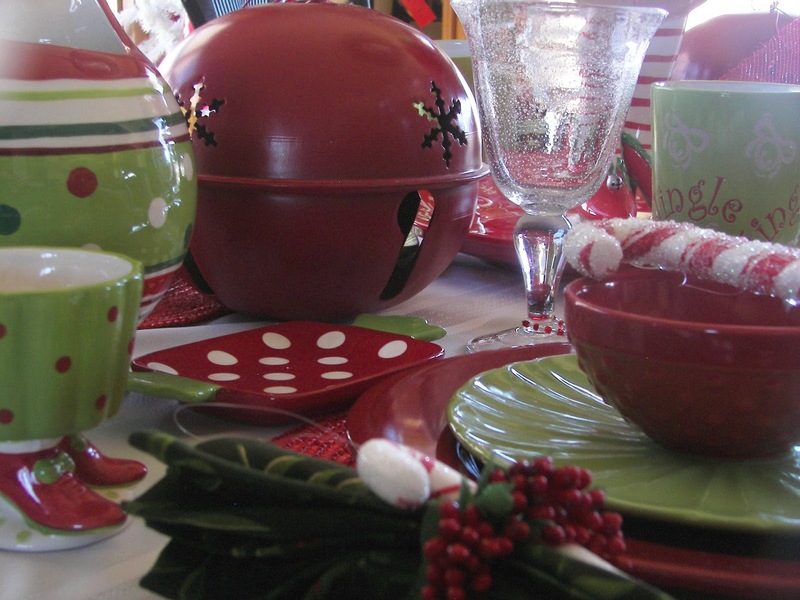 The green mugs are a new addition to my holiday dishware. I have 5 in green and 5 in red. They go perfectly with the red and green pitcher. They were $1.00 at Tai Pan Trading. 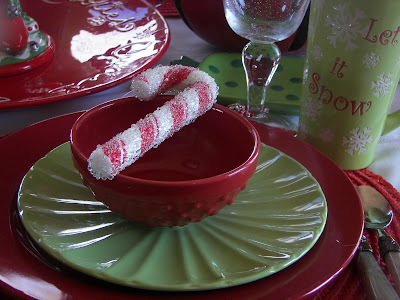 I bought quite a few dozen of those icy candy canes years ago at a craft store. 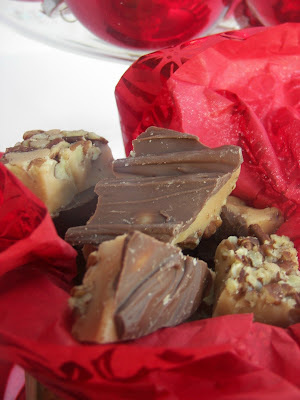 I festooned them on my cellophane bags of toffee that I gave out and thankfully saved enough to decorate my trees. Here's a long shot. I love those oversized jingle bells that add to the whimsical feeling of this table. The little footed bowl was purched at TJ Maxx and more last year. So cute. Thanks for dropping by my Whimsical Christmas Table. 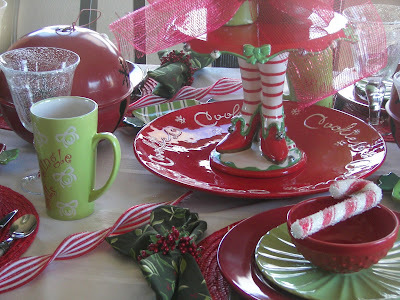 I love the lime green with red...such a nice updated Christmas look. And the footed cake platter is a hoot! I am a big fan of the red and bright green for Christmas too. Everything is so fun and pretty. I love the footed bowl, it goes so well with the footed cake plate. Its fun how your everyday plates go so nicely on the Christmas table. 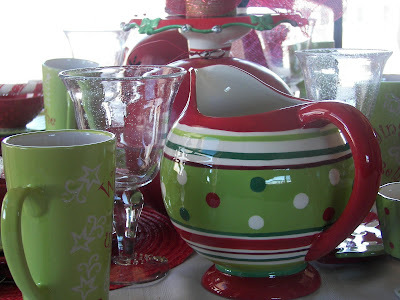 I love the footed cake stand, and the polka dot pitcher too~so cute! I have the same big, red cookie platter, Joni:) Thanks for sharing and letting me "sit a bit" at your table. I love the whimsy. 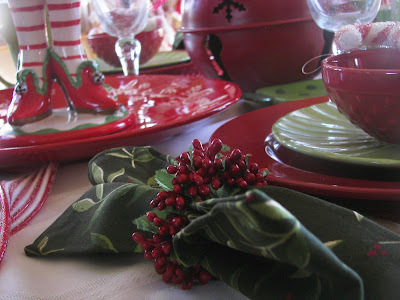 I'm a red and green gal, too, so I really appreciated this table. Such a fun table Joni. I love the polka dotted pitcher. Thanks for sharing this whimsical tablescape. Your always so creative. Soooo cute Joni and I love the red and bright green together too. What an eye you have for collecting fabulous accessories. It all goes so well and I wish I had some of it for my girlfriend luncheon tomorrow. Was the gift from Jackie? It just has her name stamped all over it. 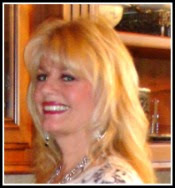 I simply love the two of you and the great things you share on your fun blogs....pinning! So adorable! Love the feet! The colors are so cheerful! So many cute things to look at here... what a fun table! wow what is awesome posting. I love the whimsy! Adorable footed cake plate & bowl! This is just so cute and fun! I want to drop by and sit right down!! Adorable cake plate!! I love every detail! Merry Christmas! What a whimsical holiday table! I love lime and red together. Oh this is adorable! 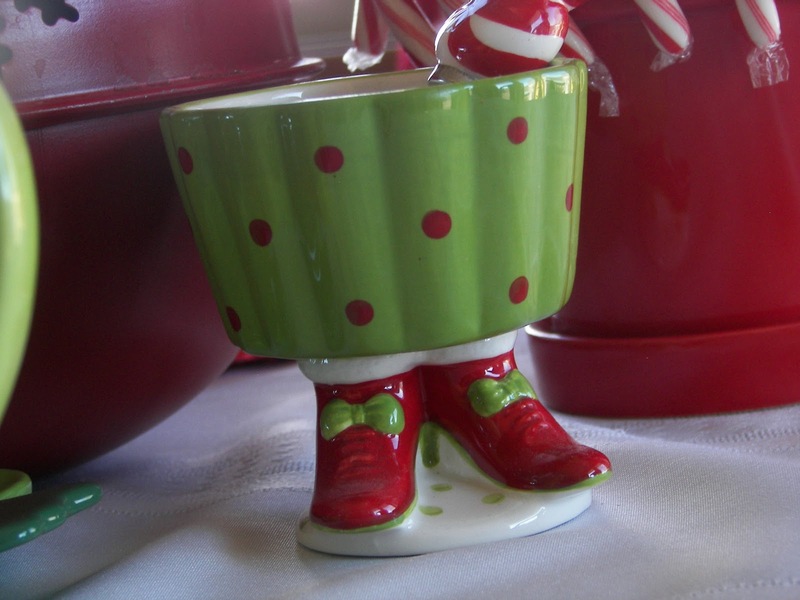 I love everything footed, specially the cake stand, but really, I love everything else too! Your tablescape is so whimsical for Christmas and makes me so happy and warm. Thank you for sharing. Merry Christmas. I love your table. The little footed bowl and cake plate are adorable! I love dishes, and when you put them in shoes...Love them even more!! Thanks for showing your beautiful tablescape. You own some of the most FUN pieces!!! That centerpiece is really neat!!! Your table is so festive, Joni. All the pieces you have combined are so festive and whimsical. It would be fun sitting down to your lovely table. Oh Joni, this table is so cute and fun. I love it all, especially the footed plate and bowl. 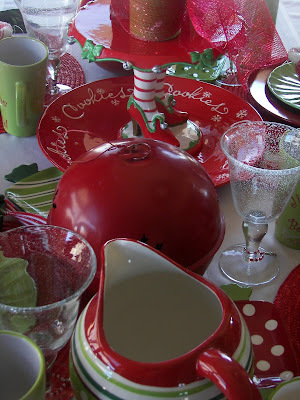 The colors are so bright and festive..
Love the table, so much fun, and very colorful. Hope everything is going well!